Досліджено питання, що стосуються природи сучасної гібридної війни в Україні. Розглянуто диверсію як один зі способів ведення такої війни, проаналізовано диверсійні діяння, об’єктом яких є склади боєприпасів, що розміщені на території України. Надано пропозиції щодо вдосконалення та доопрацювання системи протидії таким диверсійним заходам. Seredenko M.M. and Yefimov H.V., 2014. Views on the forms and methods of using the constituent structures of the security and defense sector of the state during joint operations in different conditions of the military-political situation [Pohliady na formy i sposoby zastosuvannia skladovykh struktur sektoru bezpeky i oborony derzhavy pid chas spiklykh dii v riznykh umovakh voienno-politychnoi obstanovky]. Collection of scientific papers of the Military Academy, Odessa – Zbìrnik naukovih pracʹ Vìjsʹkovoï akademìï, No. 2, pp. 161-171. Available at http://nbuv.gov.ua/UJRN/zbnpva_2014_2_25 [Accessed 15 October 2018]. Kateshchenok A.V. and Neklonskyi I.M., 2017. Model of origin and distribution in case of fire sabotage carried out by initiating fire on an important element of the object without penetration on its territory [Model protsesu vynyknennia i rozpovsiudzhennia pozhezhi u razi dyversii, shcho zdiisniuiutsia shliakhom initsiiuvannia pozhezh na vazhlyvykh elementakh obiekta bez pronyknennia na yoho terytoriiu]. Information Processing Systems – Sistemi obrobki ìnformacìï, [online] Vol. 149, No. 3, pp. 164-168. https://doi.org/10.30748/soi.2017.149.32. Puyvelde D. Van, 2015. Hybrid war – does it even exist? [Hibrydna viina – chy vona vzahali isnuie?]. NATO Review, [online]. Available at https://www.nato.int/docu/review/2015/Also-in-2015/hybrid-modern-future-warfare-russia-ukraine/UK/index.htm [Accessed 16 October 2018]. Herasina L.M., Pohribna V.L. and Polishchuk I.O. (compositors), 2015. Politological encyclopedic dictionary [Politolohichnyi entsyklopedychnyi slovnyk], Kharkiv: Pravo. P. 816. (Ed: Trebin M.P.). Popovych K.V., 2016. Hybrid war as a modern method of warfare: historical and contemporary dimensions [Hibrydna viina yak suchasnyi sposib vedennia viiny: istorychnyi ta suchasnyi vymiry]. 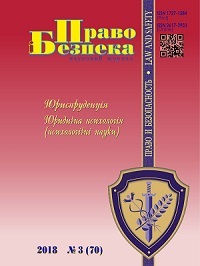 Scientific herald of Uzhhorod University. Series: History [Naukovyi visnyk Uzhhorodskoho Universytetu. Seriia “Istoriia”], Vol. 35, Iss. 2, pp. 75-79. Available at http://nbuv.gov.ua/UJRN/Nvuuist_2016_2_13 [Accessed 16 October 2018]. Dubov D.V., Barovska A.V, Isakova T.O., Koval I.O and Horbulin V.P., 2017. “Active measures” of USSR against USA: preface to hybrid war. Analytical report [“Aktyvni zakhody” SRSR proty SShA: proloh do hibrydnoi viiny]. 2nd ed. Kyiv: NISD. Available at http://www.niss.gov.ua/content/articles/files/Aktivny_Zahody-Print_Bleed=5mm-4f2c3.pdf [Accessed 17 October 2018]. Sulc L.B., 2010. Active measures, quiet war and two socialist revolutions. Washington, D.C.: The Nathan Hale Institute. Available at https://www.cia.gov/library/readingroom/docs/CIA-RDP90-00806R000200720008-2.pdf [Accessed 16 October 2018]. Kot K. and Matiukhina N., 2017. Armament depots in ukraine: history of explosions, fire situations and victims [Sklady zbroi v Ukraini: istoriia vybukhiv, pozhezh i zhertv]. BBC News. Ukraine, [online]. Available at https://www.bbc.com/ukrainian/features-41414138 [Accessed 16 October 2018]. Torop O. and Shramovych V., 2018. Poltorak: There are still people in the army who perceive Russia as a brother [Poltorak: v armii dosi ye liudy, yaki vvazhaiut Rosiiu bratom]. BBC News. Ukraine, [online]. Available at https://www.bbc.com/ukrainian/features-43851256 [Accessed 16 October 2018]. Prokopenko O., 2018. Arsenal of Weapons Will Be Guarded by a New Division [Arsenaly zbroi okhoroniatyme novyi pidrozdil]. Government courier – Urâdovij kur'êr. Available at: https://ukurier.gov.ua/uk/articles/arsenali-zbroyi-ohoronyatime-novij-pidrozdil/ [Accessed 16 October 2018]. Karmannyi Ye.V. and Lys M.V., 2018. Organizational and Legal Issues of Improvement of the Logistics System of Military Forces Munitions in the Context of Opposition to Modern Sovereign Measures [Orhanizatsiino-pravovi pytannia udoskonalennia systemy tylovoho zabezpechennia boieprypasamy viiskovykh formuvan u konteksti protydii suchasnym dyversiinym zakhodam]. In: National Academy of the National Guard of Ukraine, Topical issues of service and military activity of military formations and law enforcement agencies [Aktualni pytannia zabezpechennia sluzhbovo-boiovoi diialnosti viiskovykh formuvan ta pravookhoronnykh orhaniv]. October 31, 2018, Kharkiv. Kharkiv: NANGU. Karmannyi, Y. і Lys, M. (2018) Протидія диверсійним заходам щодо складів боєприпасів у контексті сучасної гібридної війни, Право і безпека, 70(3), pp 16-21. doi: 10.32631/pb.2018.3.02.